On July 2, 2001, Jeremy Roenick signed as a free agent with the Philadelphia Flyers. In his first season with the Flyers, he won both the Bobby Clarke Trophy (MVP) and Yanick Dupre Memorial (Class Guy) team awards. He led the team with 46 assists, 67 points and a +32 plus-minus rating as the Flyers won the Atlantic Division title. On January 30, he scored his 1,000th NHL point in a game against the Ottawa Senators. Three nights later, he played in the mid-season All-Star Game. 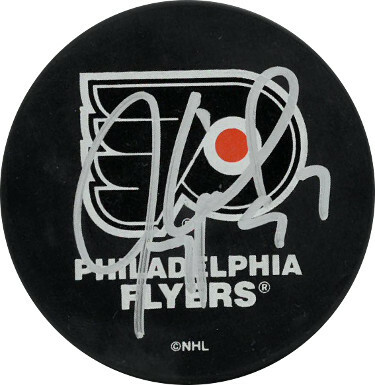 Jeremy Roenick has hand signed this Philadelphia Flyers Puck #97. Certificate of Authenticity from Athlon Sports Collectibles.